My mother was an amazing cook. Honestly, everyone wanted a care package from her when they were sick. Her Thanksgiving feast for her family of 10, and all their mates and friends, were massive and legendary. One of my mother’s traditional Thanksgiving dishes, however, rarely got eaten – the lime green Jell-O ring with pineapples and pecans. We all took multiple helpings of all of the food on the buffet, but the Jell-O ring remained untouched. If she threatened not to make it the next year, however, we all moaned with disappointment. The Jell-O ring was tradition, and it was a big part of our Thanksgiving. 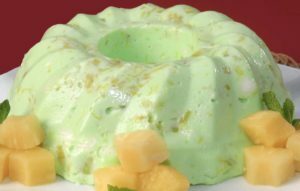 Although my mother has been gone for more than a decade, to this day, regardless of who is hosting Thanksgiving, there is a discussion about the lime green Jell-O ring. However you spend the holiday season, whoever you gather with around the dinner table, remember to give thanks for the time we have together. Here’s hoping you are creating a lifetime of memories and traditions with your friends and family this Thanksgiving. Awesome memory! I have some similar ones regarding an unidentifiable pink fluff! We were never really certain what was in it, and were afraid to ask! Thanks for sharing, Mark. That lime jello was so gross! But everything else was amazing! You took more than your fair share of turkey FYI.